NASA astronauts haven’t launched to space from the United States in nearly eight years. They’ve gone to space, of course. An American astronaut is up there right now. But they launch from Kazakhstan, at a hulking facility in the middle of the desert, in a Russian capsule, snuggled close to Russian cosmonauts, on a Russian rocket. When the U.S. government retired its iconic but expensive space shuttle program in 2011, officials promised the arrangement would be temporary. One day, human space flight would return to U.S. soil, this time with commercial companies at the helm. SpaceX and Boeing, with funding from NASA, have spent the last several yearsdesigning and building astronaut launch systems. By the end of 2018, the finish line was in sight, after frequent delays and several disapproving reviews for both companies. The first big tests of the program went on the schedule for 2019. The U.S. was gearing up to restore its capability as a spacefaring nation. And then the federal government closed. Hundreds of thousands of federal workers were sent home without pay, including at NASA. For the last three-and-a-half weeks of the shutdown, 95 percent of the space agency’s work force has been furloughed. 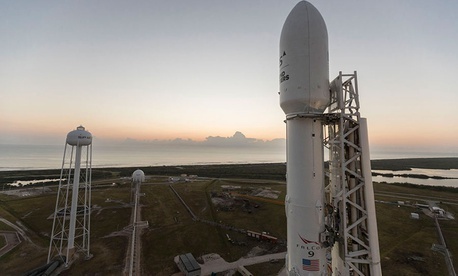 Last week, as the impasse between President Trump and congressional lawmakers calcified, NASA announced that the first significant test of the year, an uncrewed SpaceX launch, would be pushed from late January to no earlier than February. Several news reports suggested the shutdown had contributed to yet another delay. It hasn’t—at least not yet. NASA and SpaceX tell The Atlantic that, despite speculation, the government shutdown hasn’t affected their work. NASA says the astronaut program, known as Commercial Crew, is part of a small group of NASA activities that are exempt from the government closure, including International Space Station operations, the agency says. “We believe it’s a national imperative to return the flight of American astronauts on American rockets on American soil,” said Bob Jacobs, a spokesperson for NASA, one of the few still around to respond to questions. That means NASA employees collaborating with SpaceX on this effort are still on the job, albeit without pay. The latest schedule change, NASA said, was caused by familiar setbacks. Both sides need more time to finish testing hardware and complete various reviews. SpaceX employees have had to deal with their own workplace woes, as the company announced on Friday it has laid off nearly 10 percent of its workforce of more than 6,000 people. The layoffs, according to the company, were meant pave the way for big challenges ahead, such as the construction of a spaceship to carry humans as far as Mars. Asked whether staff involved in Commercial Crew were affected, a spokesperson said only that the downsizing was company-wide. With negotiations in Washington at a standstill, it’s unclear how long the shutdown will drag on. What would happen if NASA and SpaceX were both ready to go—ready to blast off with the first big test of this years-long effort—but the government was still closed? Would they launch anyway? “We don’t deal a lot in hypotheticals, but yes,” Jacobs said. James Gleeson, a spokesperson for SpaceX, confirmed that, yes, if NASA made the call, the company would carry out the uncrewed launch. Imagine that scenario: The nation hitting a major milestone in its venerable space program, the one that put people on the moon, while its government doesn’t have enough money to function normally. The scene may seem less hypothetical in the future, especially if crewed launches reach a steady cadence. In the 1980s, when the space shuttle was flying, the longest government shutdowns lasted a few days. Today, weeks-long closures are becoming the norm. Bipartisan bickering and rocket launches don’t operate on the same schedule, and there may come a time when one can’t wait for the other. From a practical standpoint, a Commercial Crew launch during a shutdown seems possible. SpaceX is still working. NASA staff are still working (and waiting for their paychecks). Even the 45th Space Wing, the Air Force unit that supports launches in Cape Canaveral, Florida, is working; the Defense Department received long-term funding last fall, and no Air Force employees are furloughed, a spokesperson said. Of course, it’s possible that even if NASA and SpaceX are ready, space-agency leaders will want to wait until the government reopens. After all, what fun would an important launch be if 95 percent of your staff doesn’t have the option to participate in a professional capacity? Take, for example, Thomas Zurbuchen, a top administrator at NASA. Zurbuchen wasn’t allowed to attend a historic New Year’s Eve spacecraft flyby as registered staff, but he went anywayas a guest. SpaceX’s first test flight is going to be a major moment many won’t want to miss. A week before the SpaceX layoffs, as the shutdown entered its second week, a Falcon 9 rocket was lifted onto the launchpad at Cape Canaveral for testing. The crew capsule, Dragon, sat perched on top. If SpaceX’s first demonstration goes well, a pair of astronauts will take an escalator to the top of the rocket and squeeze inside. They will become the first American astronauts to launch to space on commercially built rockets. If it happens this year, that event will align with the anniversary of the best-known milestone in the American space program: the flight of Neil Armstrong and Buzz Aldrin toward the moon, from the very same launchpad.